Abunai! - "Round-Wound" / "Deep Mu Flux + 2"
Whooooa!! Get a bong-load of this!! We spacerock reviewers often throw phrases like "mind-melting" around as casually as job applicants like to put "works well with others" on their resumes. But for their third full-length release, Abunai! have released a set of tripped out instrumentals that will melt your mind more thoroughly than water dashed the evil designs of the wicked witch of the west (and more lovingly too). 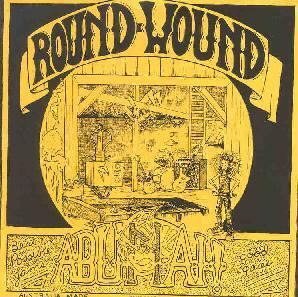 "Round-Wound" is relentless, clocking in at just a few seconds shy of the CD's available 80 minutes, each gorgeously liquid psychedelic track flowing seamlessly into the next. Abunai! is based in Boston and consists of Dan Parmenter on bass, Brendan Quinn on guitar, Kris Thompson on organ and synths, and Joe Turner on drums. I've not heard their debut CD Universal Mind Decoder, but The Mystic River Sound stuck me as a strong combination of structured songs backed by some wildly spaced music. Apparently the band spends a great deal of time improvising and decided to sift through jams recorded between 1997-2000 to make this disc. While there are no overdubs, Abunai! did take great care in mixing, cutting and pasting various segments to produce the 21 tracks that make up Round Wound. In summary, there should be a warning label on this album. The guitars and organ are absolutely searing. The pace can get quite frenzied with mad swirling organ, pulsating and droning guitars, and enough acidic licks to fry your brain into mush. There's nothing ground breaking or new about the music on Round Wound. Just 80 minutes of acidic instrumental spacerock at its very best. And if this isn't enough, or you're a collector or Abunai! completist, then you can get a few more tracks of similar music on the Deep Mu Flux + 2 10" released on clear vinyl on Camera Obscura's new Camera Lucida sub-label. Better hurry though because it's limited to 100 copies. You can visit Abunai! at their web site. Round Wound and Deep Mu Flux + 2 are distributed by Camera Obscura. You can visit their web site. Contact via snail mail at Camera Obscura; PO Box 5069; Burnley VIC 3121; Australia.